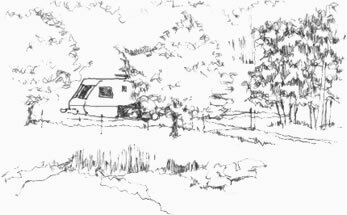 A sheltered glade “twixt lakes and fells”, for only five caravans or motor homes. A quiet and peaceful site, no tents and no children! Pitches have electricity, water, and satellite connections (Sky free to air box and cable available on request – no terrestrial TV possible) and the site has a chemical disposal point and recycling facilities. There is also a motor home waste-water disposal facility and a dog walk. Please do not drive or park on the grass without prior agreement. Lakes and Fells is open all year round. (snow, floods, or ice permitting!) Advance telephone booking is essential. £11.00 per night (inc electricity) Strictly no electric heaters in awnings. Full payment, non refundable, is required on booking for peak periods or for more than one pitch.